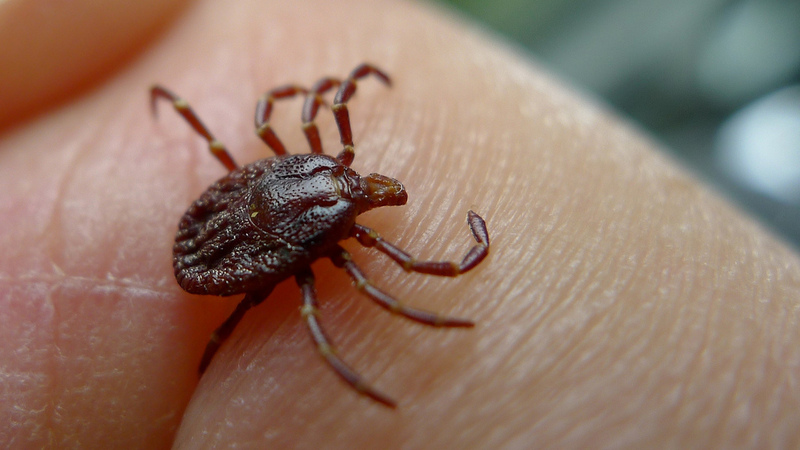 Ticks are hungry parasites that carry pathogens and diseases that are harmful to both humans and pets. The American Dog Tick, otherwise known as the wood tick, has proven to be a problematic pest for people living in Texas. Unlike the Deer Tick (a.k.a. the Blacklegged Tick), the American Dog Tick does not transmit Lyme disease but it is a vector of the pathogens that cause Rocky Mountain spotted fever and tularemia. It can even cause canine tick paralysis. American Dog Ticks are much larger than Deer Ticks by comparison. Adult male ticks are pale brown to grayish in color and are about 1.5 to 5 mm long. Females are even larger with sizes ranging from 2.5 to 7 mm long. Females are dark brown and have a cream colored dorsal shield. Once a female American Dog Tick has a blood meal, her body can become an enormous 15 mm long and be up to 10 mm wide. Ticks can be picked up on your shoes or clothes while walking in a field or pasture, thru dense underbrush or even in the woods or forest. You should always inspect yourself thoroughly to make sure you haven’t brought one of these parasites home on your person. If you know you have a tick infestation, it’s extremely important to make an appointment with your local trusted pest control company. Contact AJB Pest & Termite today to discuss your options and take a step towards getting rid of ticks for good.